PulsePoll™ from Market Connections, Inc. and Lohfeld Consulting Group shows government contractors re-architecting their businesses in response to changing government market. “It is clear that sequestration and the government shutdown have had a tremendous impact on the government contracting community,” said Lisa Dezzutti, president and CEO of Market Connections, Inc.
Nearly two-thirds of government contractors experienced moderate to significant revenue decline in 2013 as a result of sequestration and the government shutdown, according to a new PulsePoll™ of government contractors by Market Connections, Inc. and Lohfeld Consulting Group, Inc. 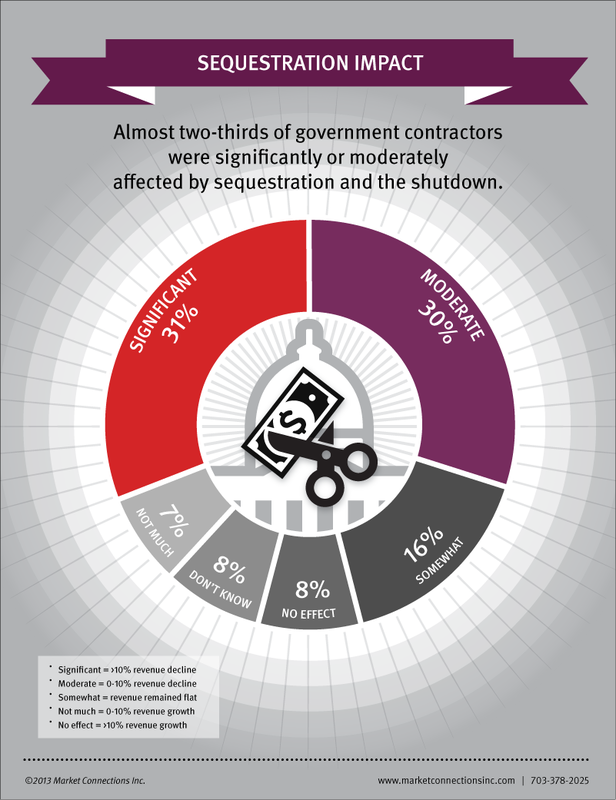 The online PulsePoll™ of 220 government contractors gauged the impact of sequestration and the government shutdown on government contractors, and how companies are responding to a changing market. Nearly one-third (31 percent) of contractors said their revenue declined more than 10 percent in 2013 due to sequestration and the shutdown, and another 30 percent declared moderate revenue declines of up to 10 percent. Fifteen percent of respondents experienced moderate to significant growth, while 16 percent said revenue remained flat. Eight percent of contractors declined to comment about their revenue change. A significantly greater proportion of large businesses indicated that 2013 revenue was essentially flat or had a moderate decline, while a significantly greater proportion of small businesses indicated a significant decline in revenue. In response to government market pressures, contractors are re-architecting by expanding into adjacent markets (45 percent), modifying lines of business (35 percent), and putting greater emphasis on the front-end of the lifecycle to improve capture strategies and increase revenue in 2014. Forty percent of respondents also said they are expanding into new federal agencies. In addition, more contractors are embracing agile staffing strategies, augmenting their talent with external consultants. Market Connections delivers actionable intelligence and insights that enable improved business performance and positioning for leading businesses, government agencies, and trade associations. The custom market research firm is a sought-after authority on preferences, perceptions, and trends among government executives and the contractors who serve them, offering deep domain expertise in information technology and telecommunications, healthcare, and education. Market Connections also provides the tools for organizations to expand thought leadership in their respective markets, and is known for the annual Federal Media and Marketing Study and ongoing PulsePolls™ of the government market. For more information, visit: http://www.marketconnectionsinc.com. About Lohfeld Consulting Group, Inc.
Lohfeld Consulting Group specializes in helping government contractors win business in the civilian, Department of Defense (DoD), intelligence, and state and local government markets by providing expert assistance in Go-To-Market planning, pipeline development, capture and proposal process consulting, capture management, proposal management, writing, and review—all backed by professional training. For more information, visit: http://www.LohfeldConsulting.com.